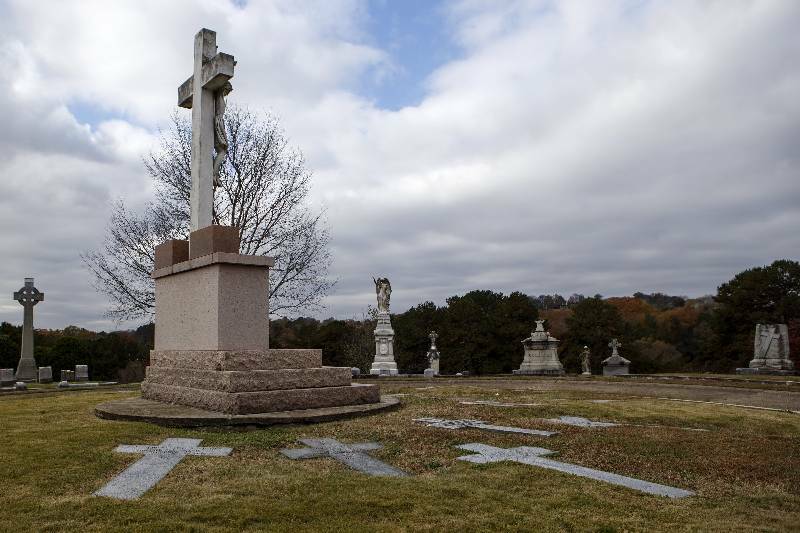 Father Patrick J. Ryan's grave is seen in Priest Circle in Mount Olivet Cemetery on Tuesday, Nov. 20, 2018 in Chattanooga, Tenn. Ryan served as the pastor for Saints Peter and Paul's parish for six years between 1872 and 1878. The Roman Catholic Diocese of Knoxville has received permission from a local court to dig up the remains of a perished priest. Now, parishioners seeking sainthood status for Father Patrick Ryan just need approval from the Vatican. In a court proceeding Monday, Chancellor Jeffrey Atherton ordered the Hamilton County Department of Health to issue a permit to the diocese. Atherton noted there was no legal opposition: Since the diocese first announced it wanted to exhume Father Patrick last fall, Hamilton County attorneys said they likely wouldn't oppose the request. Indeed, in its official Dec. 20 response, County Attorney Rheubin Taylor wrote he "has no reason to dispute" it. 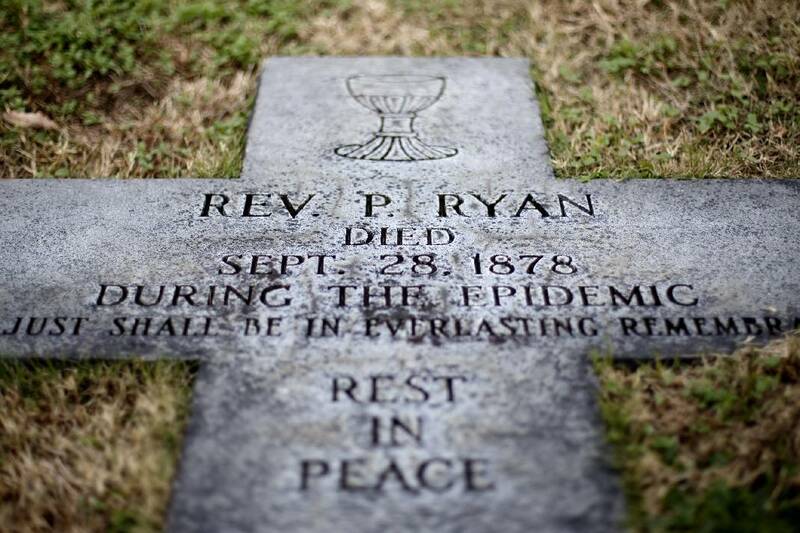 All of this is part of a two-year, first-time effort by the diocese to achieve sainthood status for Ryan, who died Sept. 28, 1878, at age 33 while volunteering to help the sick during a yellow fever epidemic in Chattanooga that claimed 366 lives and saw about 80 percent of the city's population flee. That process requires the diocese to prove Ryan existed, hence digging him back up, as well as verifying two miracles associated with him. The ultimate plan is to relocate him from the Mt. Olivet Cemetery in East Ridge to the Basilica of Sts. Peter and Paul on Eighth Avenue. Chattanooga attorneys for the diocese said they filed a petition against the Department of Health because they'd reached a roadblock. Though Tennessee law allows anyone to petition for permission to dig up and move a body, it also requires a living descendant. Here, the diocese said it didn't have one. According to court documents, a review of emigration records and other correspondence, Ryan wasn't known to have fathered any children. Ryan's body probably wouldn't be unearthed and moved immediately. Terrance Jones, an attorney who filed the petition, said the diocese now must send an exhumation request to The Vatican for approval. "That's primarily it," Jones said. "Chattanooga Funeral Home told me they're only expecting to find some bone fragments. The hope is they'll find enough to conclusively identify gender and age. But they're also going to be relying on documentary evidence about where he was buried and so forth." Ryan has a storied history in Chattanooga. After his family emigrated from Ireland to New York in the 19th century, Ryan entered St. Vincent's College in Cape Giradeau, Missouri, in 1866 to study for the priesthood. He was then ordained in Nashville in 1869 and sent to Chattanooga, where he helped open the city's oldest private school, Notre Dame, the diocese wrote in court documents. After his death during the plague, Ryan was initially buried in a church building that would become the Basilica of Sts. Peter and Paul, Ryan. Citizens later moved him to Mt. Olivet Cemetery when it opened in 1886, carrying him by a procession of horse and buggy. The Chattanooga Times, as it was then called, published an editorial hailing his "unselfish and efficient work" during the epidemic. The editorial mentioned witnesses who saw Ryan cheerfully going door to door in the "worst infected section of the city" at the time. Ryan has already cleared one hurdle of sainthood by being declared a "servant of God." Now, parishioners are searching for any miracles stemming from an intercession prayer that invokes Father Ryan's spirit. The altar in Priest Circle is seen in Mount Olivet Cemetery on Tuesday, Nov. 20, 2018 in Chattanooga, Tenn. Father Patrick J. Ryan served as the pastor for Saints Peter and Paul's parish for six years between 1872 and 1878. His grave is marked by the second-from-the-left cross.